I like to bake. I am not a great cook but I do like to bake. Ollie and I bake every week. Usually it's choc-chip/raisin cookies but today it was a banana cake. Banana Cake is G's favourite. When we were 'courting' I used to drop by his house and leave a banana cake in the kitchen for him. Awwww...When we built our new house we designed a space for an upright freezer. Grant joked that it was for all the frozen bananas I hoard. Anyway I have tried many a banana cake recipe and this one has been my favourite for a while now. I thought I'd share because it really is easy and yummy too. Mix butter and sugar, then add bananas, then eggs, just keep mixing and adding each ingredient until it is all nicely combined. Grease and flour your cake tin. Pour in mixture and give it a tap so it settles. Bake for 55-60 minutes at 180 degrees. Insert a skewer to check that it's done-the skewer should come out clean. Set aside in the tin to cool for a bit, then transfer cake to a wire rack to finish cooling. Place ingredients in mixing bowl and use an electric beater to beat mixture until it's pale and creamy. Spread over cake and cut yourself a slice to have with a cuppa! Today we were going to visit Great Nanna Belle. I thought I'd take her a banana cake. Nanna Belle broke her hip a little while back and has been in nursing care. She has recovered beautifully but is no longer able to live at home and care for herself safely. She is very capable in many ways but she really does need some round the clock care. So she has just moved into her new 'home'. It's been hard for her to leave her home, her 'things', her memories. She has spent her life there. It's been hard for Grant's dad too(it's his mum) but it is right. Let me tell you she celebrated her 97th!!!!! birthday last month. Isn't that FANTASTIC! So I decided to bake a tiny cake. Perfect for one! I split the mix between three small tins(6 x 3 1/2 inch loaf tins). It only took half the baking time for these mini versions. They turned out beautifully! Mmmmmm...I LOVE banana cake with cream cheese icing Lea! Thanks for sharing your recipe with us! 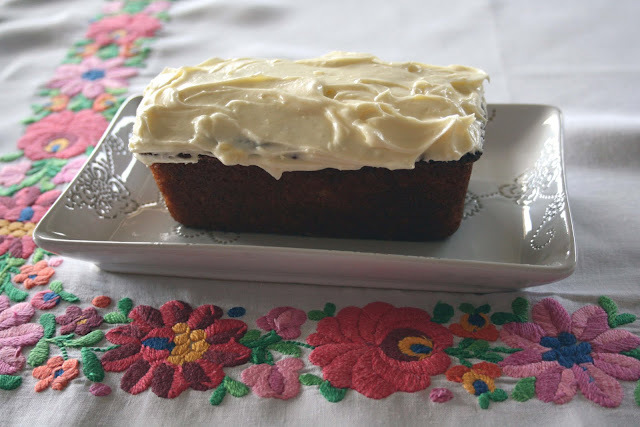 Yum I love banana cake - cream cheese icing is the BEST!! Love your tablecloth! Is that a family heirloom or a Vinnies find? Oh! loving that tiny cake, and how gorgeous is that tablecloth?